1. Игошев Б.М., Усольцев А.П. История технических инноваций: учебное пособие. М.: Флинта, 2013. 246 с. [Igoshev B.M., Usol’cev A.P. History of technical innovation: a tutorial. Moscow: Flinta, 2013. 246 p. (In Russ.)]. 2. Lumb Ph. Critical Care Ultrasound: Expert Consult. Philadelphia: Elsevier Health Sciences, 2015. 3. Kutz M. Handbook of Materials Selection. NewYork: John Wiley & Sons, 2002. 403 p.
4. Donald I. Sonar: The story of an experiment. Ultrasound Med Biol. 1974:109–117. 5. Hackmann W. Underwater acoustics before the first world war. In: Seek and Strike. London: Crown, 1984. P. 1–10. 6. Hackmann W. Underwater acoustics before the first world war. In: Seek and Strike. London: Crown, 1984. P. 73–95. 7. Абрикосов И.А., Крылов Н.П. Практическая физиотерапия. М., 1961 [Abrikosov I.A., Krylov N.P. Practical physiotherapy. Moscow, 1961 (In Russ.)]. 8. Фридман Ф.Е. Ультразвук в офтальмологии. М., 1973. С. 14–135 [Fridman F.E. Ultrasound in ophthalmology. Moscow, 1973. P. 14–135 (In Russ.)]. 9. Петрищева Т.С. Фонофорез дексаметазона в терапии помутнений роговицы после вирусных кератитов. Трактат пятого Всесоюзного съезда офтальмологов. М., 1979;4:118–119 [Petrishcheva T.S. Phonophoresis of dexamethasone in the therapy of corneal opacities after viral keratitis. A Treatise of the Fifth All-Union Congress of Ophthalmologists. Moscow, 1979;4:118–119 (In Russ.)]. 10. Мармур Р.К. Ультразвуковая терапия и диагностика глазных заболеваний. Киев: Здоровя, 1974. С. 30–36 [Marmur R.K. Ultrasonic therapy and diagnosis of eye diseases. Kiev: Zdorovya, 1974. P. 30–36 (In Russ.)]. 11. Purnell E.W., Sokollu A., Holasek E. The production of focal chorioretinitis by ultrasound. Am J Ophthal. 1964:58. 12. Karlin D. Ultrasound retinal detachment syrgery. Trans Amer Acad Ophthalmol Otoiaryng. 1969;6:1061–1076. 13. Nakajima A. Ophthalmology congress in America. Ophthalmology (Tokyo). 1968;10:681–683. 14. Kelman C.D. Phaco-emulsification and aspiration. Am J Ophthal. 1967;64:23–35. 15. Ходжаев Н.С., Дыбенко Л.И., Завалишина Л.Э. К вопросу о возможных механизмах влияния ультразвука при факоэмульсификции на ткани глаза. Acta Biomedica Scientifica. 2011:179–181 [Hodzhaev N.S., Dybenko L.I., Zavalishina L.E. On the possible mechanisms of the influence of ultrasound in phacoemulsification on the eye tissue. Acta Biomedica Scientifica. 2011:179–181 (In Russ.)]. 16. Азнабаев Б.М. Ультразвуковая хирургия катаракты — факоэмульсификация. М., 2005. 136 с. [Aznabaev B.M. Ultrasonic cataract surgery — phacoemulsification. Moscow, 2005. 136 p. (In Russ.)]. 17. Краснов М.М. Клиническое применение ультразвуковой хирургии при отслойке сетчатки. Патология сетчатой оболочки и зрительного нерва. М., 1971. С. 30–32 [Krasnov M.M. Clinica lapplication of ultrasound surgery in retinal detachment. Pathology of the reticular membrane and optic nerve. Moscow, 1971. P. 30–32 (In Russ.)]. 18. Краснов М.М., Голямина И.П., Танеева Л.И., Субботина И.Н. О принципах и возможностях применения низкочастотного ультразвука в офтальмохирургии. Вестник офтальмольмологии. 1969;5:20–26 [Krasnov M.M., Golyamina I.P., Taneeva L.I., Subbotina I.N. On the principles and possibilities of using lowfrequency ultrasound in ophthalmic surgery. Annals of Ophthalmology = Vestnik oftal’mologii. 1969;5:20–26 (In Russ.)]. 19. Гундорова Р.А., Малаев А.А., Южаков А.М. Травма глаза. М., 1980. С. 130–143 [Gundorova R.A., Malaev A.A., Yuzhakov A.M. Injury of the eye. Moscow, 1980. P. 130–143 (In Russ.)]. 21. Фридман Ф.Е., Гундорова Р.А., Кодзов М.Б. Ультразвук в офтальмологии. М.: Медицина, 1989. 256 с. [Fridman F.E., Gundorova R.A., Kodzov M.B. Ultrasound in ophthalmology. Moscow: Medicine, 1989. 256 p. (In Russ.)]. 22. Gohr H., Wedekind T. Der ultraschallin in der medizin. Journal of Molecular Medicine. 1940;19(2):25–29. 23. Meire H.B. An historical review. In: Basic ultrasound. West Sussex: John Wiley & Sons, 1995. P. 1–7. 24. 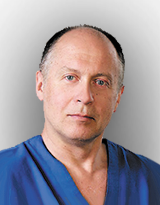 Holm H.H., Skjoldbye В. Interventional Ultrasound. Ultrasound Med Biol. 1996;22:773–789. 25. Levi S. The history of ultrasound in gynecology 1950–1980. Ultrasound Med Biol. 1997;23(4):481–552. 26. Mundt G.H., Hughes W.E. Ultrasonics in ocular diagnosis. Am J Ophthalmol. 1956;41:488–498. 27. Oksala A., Lehtinen A. Diagnostic value of ultrasonics in ophthalmology. Ophthalmologica. 1957;134:387–395. 28. Baum G., Greenwood I. The application of ultrasonic locating techniques to ophthalmology: theoretic considerations and acoustic properties of ocular media: Part 1. Reflective properties. Am J Ophthalmol. 1958;46:319–329. 29. Ossoinig K.C. Standardized echography: basic principles, clinical applications and results. Int Ophthalmol Clin. 1979;19:127–210. 30. Bronson N.R., Turner F.T. A simple B-scan ultrasonoscope. Arch Ophthalmol. 1973;90:237–238. 31. Coleman D.J., Lizzie F.L., Jack R.L. Ultrasonography of the eye and orbit. Philadelphia: Lea &Febiger, 1977. 32. Aburn N.S., Sergott R.C. Orbital colour Doppler imaging. Eye. 1993;7:639–647. 33. Guthoff R., Berger R.W., Winkler Р. Doppler ultrasonography of the ophthalmic and central retinal vessels. Arch Ophthalmol. 1991;109:532–536. 34. Lieb W.E. et al. Colour Doppler Imaging of the eye and orbit. Technique and normal vascular anatomy. Arch Opthalmol. 1991;109:527–531. 35. Williamson T.H., Baxter G.M., Dutton G.N. Colour Doppler velocimetry of the arterial vasculature of the optic nerve head and orbit. Eye. 1993;7:74–79. 36. Pavlin C.J., Sherar M.D., Foster F.S. Subsurface ultrasound microscopic imaging of the intact eye. Ophthalmology. 1990;97:244–250. 37. Pavlin C.J. et al. Clinical use of ultrasound biomicroscopy. Ophthalmology. 1991;98:287–295. 38. Byrne S.F., Green R.L. Ultrasound of the eye and orbit. Philadelphia, USA: Mosby Inc., 2002. 505 p.
39. Department of Health and Human Services, Food and Drug Administration Center for Devices and Radiological Health: Information for Manufacturers Seeking Market Clearance of Diagnostic Ultrasound Systems. USA. 2008. P. 9–10. 40. Health Canada. Guidelines for the Safe Use of Diagnostic Ultrasound. USA. 2001. P. 7–26. 41. Осипов Л.В. Ультразвуковые диагностические приборы. Практическое руководство для пользователей. М.: Видар, 1999. С. 230–243 [Osipov L.V. Ultrasound diagnostic devices. A practical guide for users. Moscow: Vidar, 1999. P. 230–243 (In Russ.)]. 42. Medical Ultrasound Safety. Second Edition. AIUM. 2009:7–53. 43. Guidance for Industry and FDA staff. Information for Manufacturers Seeking Marketing Clearance of Diagnostic Ultrasound Systems and Transducers. Silver Spring. 2008. 64 p.
44. Волков В.Н. Основы ультразвуковой диагностики: Учебно-методическое пособие. М.: Мир, 2005 [Volkov V.N. Fundamentals of ultrasound diagnostics: Teaching-methodical manual. Moscow: Мir, 2005 (In Russ.)]. 45. Sheiner E., Freeman J., Abramowicz J.S. Acoustic output as measured by mechanical and thermal indices during routine obstetric ultrasound examinations. Journal of Ultrasound in Medicine. 2005;24:1665–1670. 48. Silverman R.H., Lizzi F.L., Ursea B.G., Cozzarelli L., Ketterling J.A., Deng C.X., Folberg R., Coleman D.J. Safety levels for exposure of cornea and lens to very highfrequency ultrasound. Ultrasound Med Biol. 1987;13(10):607–618. 51. Слободин К.Э. Лучевая диагностика повреждений глаз: Руководство для врачей. СПб. : СпбМАПО, 2007. С. 52–54 [Slobodin K.E. Radiation diagnosis of eye injuries: A guide for doctors. St. Petersburg: SPbMAPO, 2007. P. 52–54 (In Russ. )].